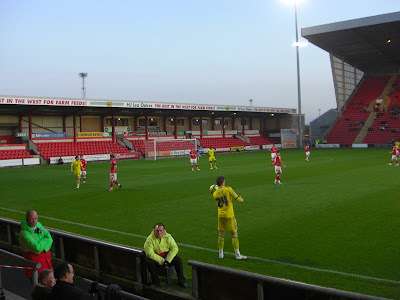 My seventy-eighth stadium of 2011 was on Saturday 12th November 2011 at Gresty Road in Crewe, Cheshire. 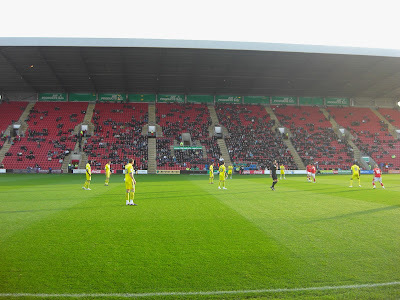 The match was Crewe Alexandra vs. Colchester United in the F.A. Cup 1st Round. Gresty Road (also known as the Alexandra Stadium) sits directly next to Crewe railway station and is a 300 yard walk from the station exit. 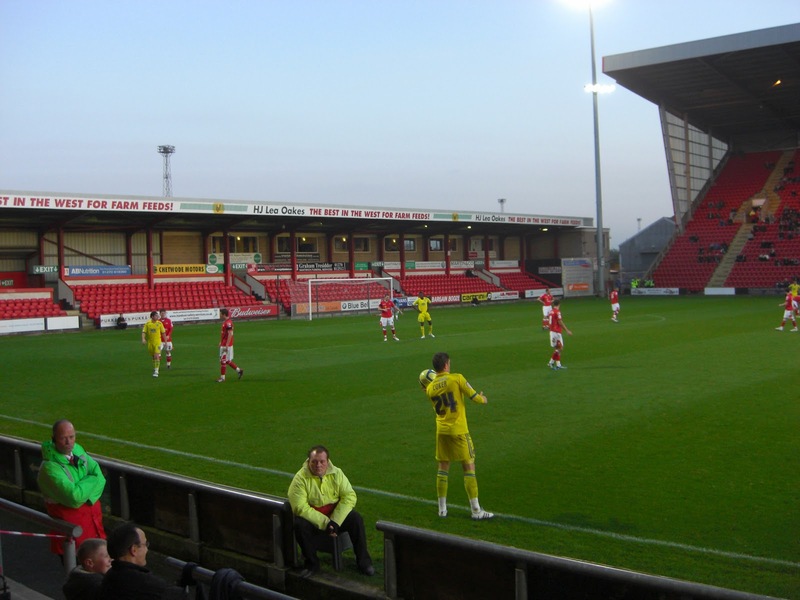 The ground has been home to Crewe Alexandra since 1906. The stadium is dominated by the Air Products Stand running the length of the pitch on the south side of the venue. This structure, built in 1999, is a large single-tiered stand which can hold 6,809 fans, around two-thirds of the stadium's total capacity. Opposite this is the 1,680 capacity Blue Bell BMW Stand. This is a long, thin stand where away fans are housed and is where I watched the game from. Behind the goal on the west side of the venue is the Mark Price Stand, a small stand for the remainder of home supporters not sitting in the Air Products Stand. The Mark Price Stand has a capacity of 982 making it the second smallest in the ground. Behind the goal on the east side of the venue is the smallest stand, the Wulvern Housing Stand. This stand is only a matter of feet in front of the grass bank which runs down the the railway track so is very limited in space. It can fit just 682 fans although is only opened for occasional high profile games at the club. As this fixture was not one of them the stand remained closed for this match. The game was an F.A. Cup 1st Round tie between League Two side Crewe Alexandra and League One side Colchester United. The home side started brightly and in the 19th minute took the lead after a swift counter-attack from a Colchester corner led to Byron Moore tapping in a rebound from close range. 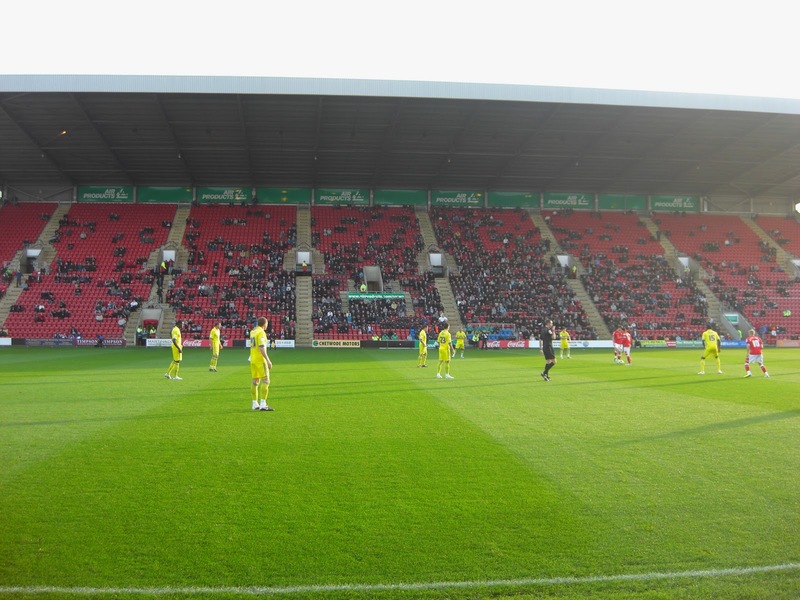 Barely a minute later however, Crewe found themselves down to ten men after Ashley Westwood's two-footed lunge on Ben Coker earned him a deserved red card. 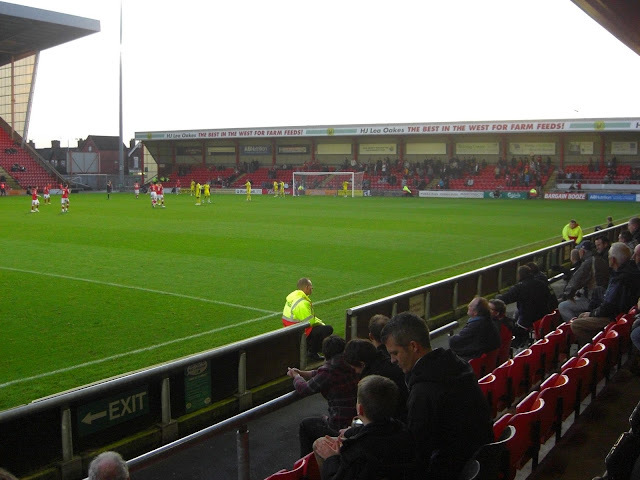 The visitors rarely troubled the Crewe goal as the first-half finished 1-0. The game sprung into life for Colchester on the hour-mark after a brilliant 35-yard strike by Lloyd James went in off the crossbar, and from this point on it was one-way traffic as Crewe rarely got out of their own half. On 77 minutes a series of Colchester corners paid off as Andy Bond steered the ball though a crowd of players to make it 2-1. With a few minutes remaining Ben Coker cut inside from the left wing and produced an excellent finish into the bottom corner to extend Colchester's lead. With Crewe beaten, Lloyd James added a fourth in injury time with a low shot from the edge of the box to wrap up a 4-1 win for the visitors.